I am not letting go of this cookie! L looks a lot different now, but back in 2008, we had just got the keys to our new house. Having previously lived in a first floor flat, he was thrilled to have a little garden to play in. So much so, he quickly used up all his beans, mid-biscuit! It does look like a great way to spend a Sunday afternoon, doesn't it? You're welcome, hopefully see you next week! Ha! Bless the little man. You'd never catch me falling asleep mid-biscuit! Such a cutie, love how he's still holding onto his biscuit! 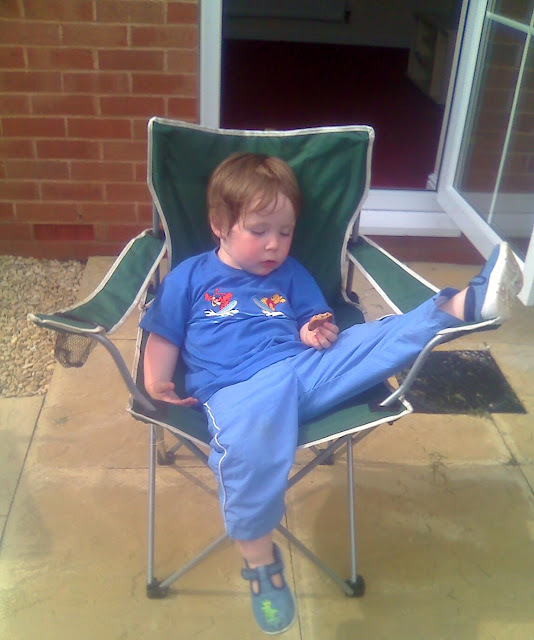 My kids always had a thing about putting their legs up and then falling asleep. Did the cookie survive the sleep intact? So cute- he looks worn out after the hard work of being a kid!! Ah cute - it looks like he's really chilling out there. Oh bless, that's so sweet. Oh to be able to fall asleep at the drop of a hat like that still! Luke looks very chilled and relaxed.. chillaxed? !